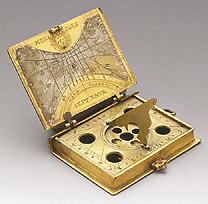 This precious portable sundial, probably originating from Germany, is in the form of a mass-book which can be opened like a box. It bears the logo of the Jesuit order, 'IHS'. On the cover is a lunar volvelle, which displays the phases of the moon. The hour lines are traced on the reverse of the cover. Inside the instrument is a folding gnomon, mounted on a compass, which is now incomplete, but which guaranteed the correct orientation of the instrument. On the back of the instrument are the planetary or unequal hours.